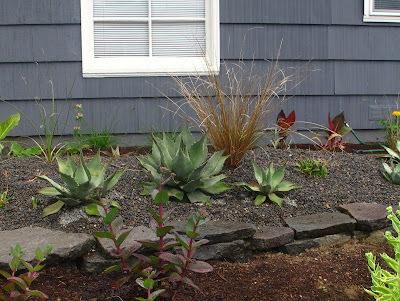 Loree recently asked how my agaves were handling their first winter in the ground. They were planted back in May in the berm. I amended the soil with chicken grit and mulched them with gravel. I'm happy to say that so far they are doing great. No black spots or rot as of yet. Of course, we have many wet months still to come. My fingers are crossed! Looks like you got it right...good job!